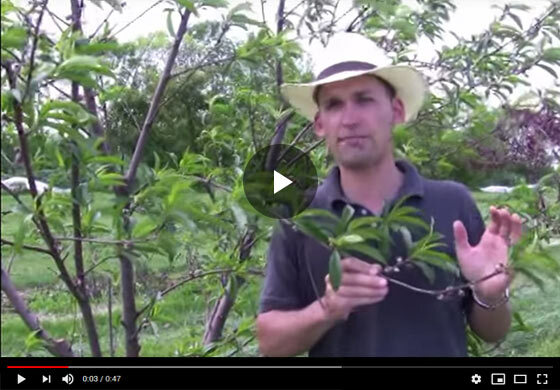 Felix, our horticulture expert at Gurney's speaks of the key differences between thinned and non-thinned peaches and reveals the secret to growing jumbo-sized fruit. Hi everyone Felix here with Gurney's and today I want to talk to you about a really nice garden trick to get big fruit on your peaches and that's fruit thinning. This is how you can get your fair, big, world-record sized peaches with some little tricks and spacing out your fruit load on your plants. So what we're doing here today to show you how important it is if we've taken two peaches, same variety and they're planted side-by-side and you'll, see that with the later shot, when I get to work on thinning this, and I want to show you the difference since You can get with two peaches, one thin one, not fine folks, so here we are up close with our tree that we're going at then between these two, and I want to show you what happens when you have a really nice crop. Look like we do with these peaches. Both these peaches have a full set out, it's about eighty five percent of the flowers on the tree actually got pollinated and some fruit. You look closely here, you'll see what I'm talking about. This is the time you want to tennis, but you have these old flowers here, dried up and then cracked under the development of that whole fruit, underneath it and those are pull off. This is a stage called shuck split because those little pieces here which are actually the flower elements, are cracked and coming up easily from the fruit. So you can see our little baby, peaches developing here and one thing to note: some of them are bigger than others, and that's just the fruit that is flowered earlier and maybe got a little better pollination than the others. But all of these fruit you see here, will actually set continue to develop and what we're doing with this thinning trick is to limit how many are on this branch. So we don't get lip breakage, and so we get bigger fruit. So what we want to do is produce the fruit quantity down to one fruit for every four inches of branch length, so this one's nice and big so I'd like to keep it and you just pinch off all the other fruit. Now the branches apart another one. It's really easy to do all the way down the branch try to make leave the biggest fruit you can see. Now I have basically one fruit for every four inches of branch and there's really not any more than this branch and support these forked whopper size and then your pitch responses. Remember your Sun Direction! Those word that are going to get exposed to the Sun more I'm going to be sweeter. That's very important point to further develop. You want to take the lights off first, that are below on the bottom of your branch. No, it's going to be shaded out as this chute extends and there's more foliage, it's going to shade out those lower fruit, and so you want to leave fruit that are going to get more sun exposure. So that's another consideration when you're deciding which fruit to keep and which fruit to take off in addition to the 4-inch wall between fruit.